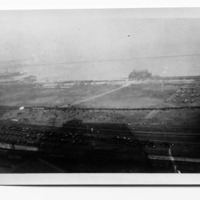 Marked on the verso in pencil as "Knights of Pythias Review" by the photographer planner Edward H. Bennett, this photograph is identified as a Grant Park celebration in 1917 by William Hudson Harper, Chicago: A History and Forecast, 1921, p. 166. The Chicago Tribune in 1917 indicates a "celebration" in Lincoln Park, July 28, 1917; but there could have been a parade on Michigan Avenue. In addition, the Knights of Pythias are among the groups on parade for Memorial Day, May 30, that first spring of World War I. The vantage point is atop the Railway Exchange Building, the location of Bennett's office, the former Plan of Chicago office, 1906-09. This is one of series of similar photographs. Michigan Avenue and Grant Park, Chicago, south of the Railway Exchange Building on the east side of the street and facing the Art Institute of Chicago. 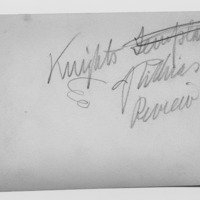 Bennett, Edward H. (Edward Herbert), 1874-1954 , “Knights of Pythias review (no. 1),” Digital Collections - Lake Forest College, accessed April 26, 2019, http://collections.lakeforest.edu/items/show/1899.